Conner Stroud, 13, was born without hips, ankles, femurs or knees, a result of Bilateral Proximal Femoral Focal Deficiency. Despite his disability he began playing tennis as a 4 year old. 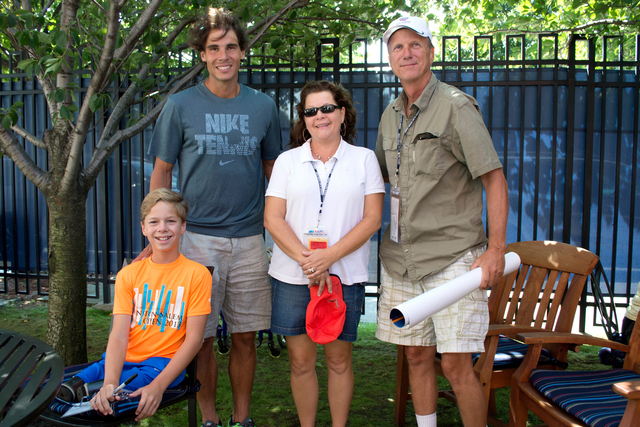 His favorite player is Rafael Nadal, and today he had the opportunity to meet our special champion! He watched him compete in person for the first time on 2013 Opening Day. And for a special treat, Nadal visited with the Strouds after practice Tuesday, greeting Conner with a handshake and rub on the head. He then heard that they watched him play his opening match. “You watched me play yesterday?” “Did you like it?” - Nadal said. Click here for a video of Conner Stroud hitting with Hall of Famer Jim Courier and click here for a video of Conner hitting with former world No. 1 Andy Roddick.